Highway Racing Stunt Rash - Bike Racing is entered into new zone of Road Rash. Race and stunt the bike with Highway Rider.A never ending exciting road Race amazing bikes. Fight with other bikes by kicking and punching on their bike. This Amazing Bike Road Rash allows to apply NOS and make the Bike Race Stunts Realistic. Perform exciting stunts to get bonus cash. Satisfy your passion towards race. Earn cash by winning the races. Buy new exciting Bikes from the store. This 3D Bike racing Road Rash game consisting of Endless Bike Racing Mode. There are no Checkpoints or time trial limits. 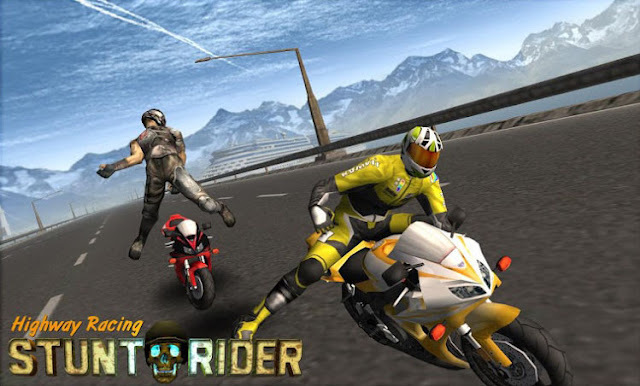 Bike Rider is free to kick and punch other biker boys and bike gangsters to maximize the fun. You need to Survive the Rash bike Attack and avoid the Biker boyz unless they will smash you in race. Racing Fever just enters to new mode of Bike Racing. Passion of racing has gone to next level of death racing mode of bikes. Perform Stunt actions and relish yourself with all the thrill of bike riding in busy city traffic. In this Death Racing Mode, fulfill your fever and passion of death racing and stunt actions but survive yourself as long you can. Take delight in the thrill of riding your bike at insane speed through lush and busy city environments! - Race as many as you can to earn cash. - Realistic 3D graphics with dynamic lighting and amazing environment of highway. - Different amazing heavy sports and chopper Bikes. - Support for HD phone devices and tablets. - Good quality sound effects. - Free Game Just Install and Enjoy..! Highway Racing Stunt Rash: install APK and play the game!